Few topics in mixology are more divisive than vodka; I never thought that was the case, but there seem to be two major camps on the issue; in the first camp, there are snobs like me, who believe that any drink that is good with vodka is better with something else. In the second camp, there are people who feel that it is wrong to judge people for their plebian tastes. I think its safe to say that, for those of us in the first camp, we don’t seriously look down on people who enjoy vodka, we simply enjoy snobbery as part of the game. If you can’t enjoy snobbery, you are taking yourself too seriously. Anyway, I’m done preaching. Today we’re going to talk about the cocktail that may have single-handedly started the craft cocktail revolution; the Cosmopolitan. Cosmopolitans made cocktails cool again, and raised the general public’s interest in drinking cocktails, which had fallen out of fashion as their production descended to McDonald’s-esque lows in the 1990s. I wish I could take credit for that insight, but it was Doug of the Pegu Blog who taught me. The ground is littered with the bodies of cocktailians who tried to turn the Cosmopolitan into a decent gin cocktail. The fabled Metropolitan heresy has wasted more good gin on bad results than you can imagine. 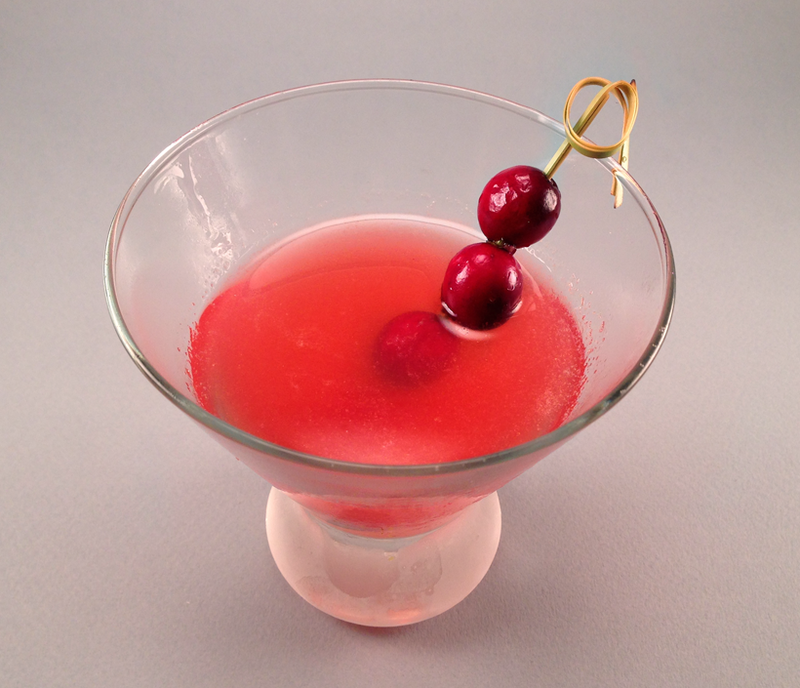 Cranberry-orange is a classic flavor pairing, but somehow it just does not mix well with gin’s botanicals. This drink became successful when we swapped the gin for J. Wray and Nephew, an overproof rum with some serious hogo. Shake over ice and double-strain into a cocktail glass. Garnish with skewered cranberries. We replaced the sweet and watery cranberry cordial that is commonly used in this drink for fresh, unsweetened cranberry juice, dialed down the lime, and balanced the sourness of the juices with a whole ounce of Cointreau. The result is a very dry, slightly sulfurous cranberry-orange pairing, brightened by a bit of lime. If you like your cosmos sweet, a dash of simple syrup would not be amiss. 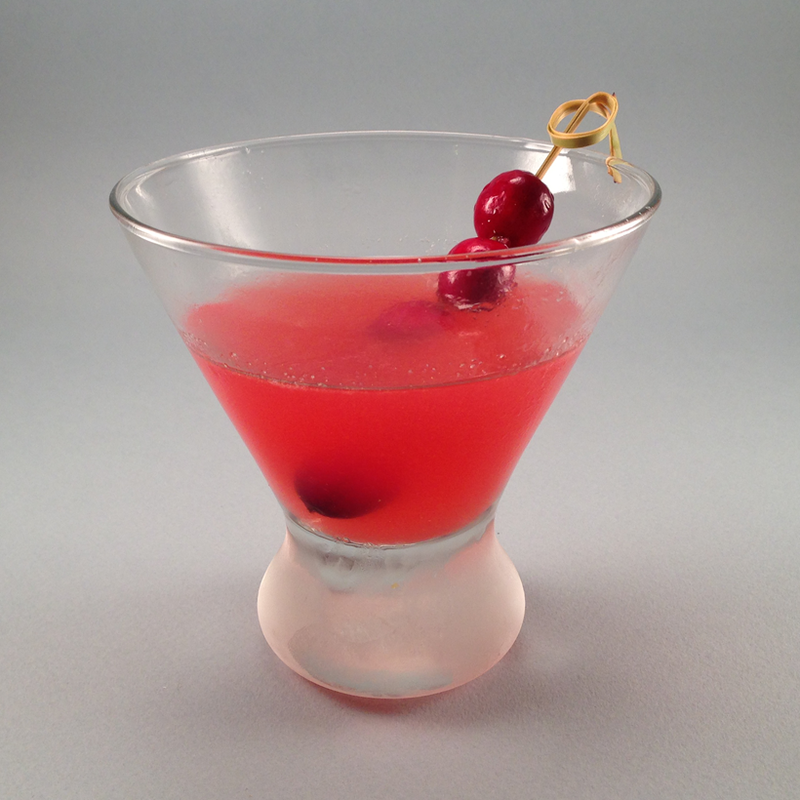 We garnished the drink with skewered cranberries, which look very nice but impart virtually no aroma. In a later version of the drink, which is not pictured, we also added small twist of orange peel, and it added both a splash of contrasting color and a mild orange oil aroma. Delightful. Categories: classics | Tags: alcohol, autumn, bartending, booze, cocktail, cocktails, cosmo, cosmopolitan, craft cocktails, cranberries, cranberry, cranberry juice, drinking, drinks, fall, fall drinks, lime juice, liquor, metropolitan, mixed drink, mixed drinks, mixology, orange, orange peel | Permalink. Swapping gin for JWray? That sounds like a project. A project along the lines of Putting Weird Things In Coffee and/or Steve, Don’t Eat It! Very interesting and a timely warning for me. I was just thinking of doing a blog post about substituting gin for vodka in a couple of popular drinks like the Cosmopolitan and the Lemon Drop. Gin lemon drop is just dandy. When I do that, I like to use St. Germain as the sweetener. I used to also add a dash of bitters to that drink, but I’m not sure if I still endorse that choice, as I have since come to the opinion that bitters often dull the sharpness of fresh lemon. Yummy, We were actually going for a rummy take on a Cosmopolitan when we came up with our Cosmo Castaway. I love the idea of using rum in this. I don’t often make a Cosmopolitan (any more) but have always made them with real, unsweetened cranberry juice and it makes a world of difference.